Tales of Terror: Crimson Dawn is another game in the series of horror story games. Even though this story is not unique at all, it is still a great game. The developers have done a great job to make it enjoyable. The only thing is that it is quite short. 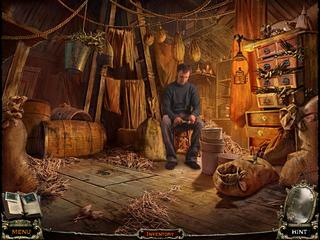 The game in a typical hidden object puzzle adventure game with a bit of interaction. Your brother gets kidnapped right before your eyes (Hasn't it happened before?). You only know that a hooded group is responsible for that.But who they are and why they did that are the qeustions to be answered. And the answers are found in a mension full of secrets. The game's audio-visual presentation is just perfect. The game has voice overs till the end. Sometimes the story is told by real people in the video cut scenes. 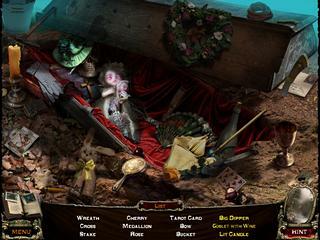 The game in a typical hidden object puzzle adventure game. The hidden object levels are interactive. The scenes are a bit dark, which increases the level of challenge, and that is something these levels need. Nevertheless, the hint system works real fast in telling you what to do and where what you are looking for is. All of the puzzles are not that difficult. But just in case you are not interested, the skip option is available very soon. The game is executed very well. The only problem is that the fun is soon over. But it depends on your experience, too. hay i know were the place is but is there a guy hidden i mean i cant find out haw 2 get the chtlos i just know were it is.is there a guy or does it just apear i mean can some 1 help me find out? Comment left at HPR:While I will not write a lengthy eccamoionl critique on the oversimplification of the labor market to supply and demand, I wanted to state the following.You mention the increase, from 1990 to 2005, $4.7 billion to $22.6 billion (480%), as support for Jack Meyer’s outrageous salary. Following the recession of early 1990s to the secondary boom of 2005, Dow Jones industrial Average quadrupled to ~420% value; while his returns were certainly great, they were not as majestic as the article makes them seem.For the best job in the investment market,(Meyer’s words) it should be possible to find others’, equally able to manage -now shrunk- the endowment. Being complacent to the rates posited by the highly corrupt and overly compensated Wall Street is hardly an excuse.If Harvard doesn’t reinvest in its social contract with the public that supports it in tax cuts approaching seven figures, it runs the risk of generating dissent against non-profit higher education, presenting serious harm to the ‘industry’ as a whole. This is Tales of Terror: Crimson Dawn review. Download this game here.